Selamat bertunang akmal n Lin...purple theme..
Moist polka dots choc cakes. wedding chocs for fattah n nurul.this is my first n3 4 2014...busy...anyway,semoga perkahwinan mereka last forever...amin...(orange favour chocs). DELICUTE OFFERS!TEDDYBEAR N CAKES WITH SPECIAL PRICE! Birthday anak anda makin dekat?tak banyak masa untuk surprise kan si kecil?Si kecil asyik remind anda tentang birthdaynya?Nak senang? ?Sacred recipe ingin menawarkan kepada anda sesuatu yg delicious n cute apadier?? TUNGGU APER LAGI? TEMPAH SEKARANG COZ LIMITED ORDER,SELAGI STOK MASIH ADA!!! ***TEMPAHAN UNTUK GUBAHAN DAN HANTARAN DIBUKA SEKARANG SILA RUJUK N3 PRODUCT. Base: Butter cake/chocolate cake,sponge cake. 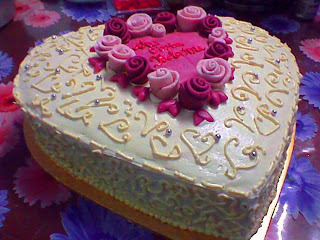 ++All additional prices for butter cream n fondant cakes are subjected to the deco item used. * Cupcakes for any occasion such as kenduri/tahlil/maulidurrasul n in bulk order u can ask for quotation (simple design). ***PRICE DUE TO NUMBERS OF ORDERS N CURRENT RATES OF INGREDIENTS. **DISKAUN ISTIMEWA AKAN DIBERIKAN KEPADA CUSTOMER YG MENEMPAH KEK HANTARAN/CUPCAKE HANTARAN SERTA COKLAT HANTARAN (ANDA DPT JIMATKAN WANG ANDA DENGAN MENEMPAH BERSAMA PRODUK TERSEBUT SELAIN TEMPAHAN GUBAHAN.